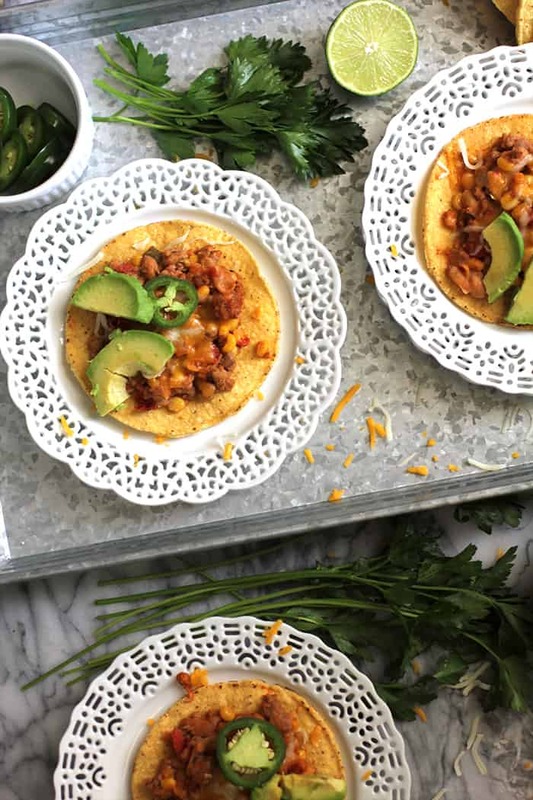 Ground Turkey and Bean Tostadas are a perfect weeknight meal. 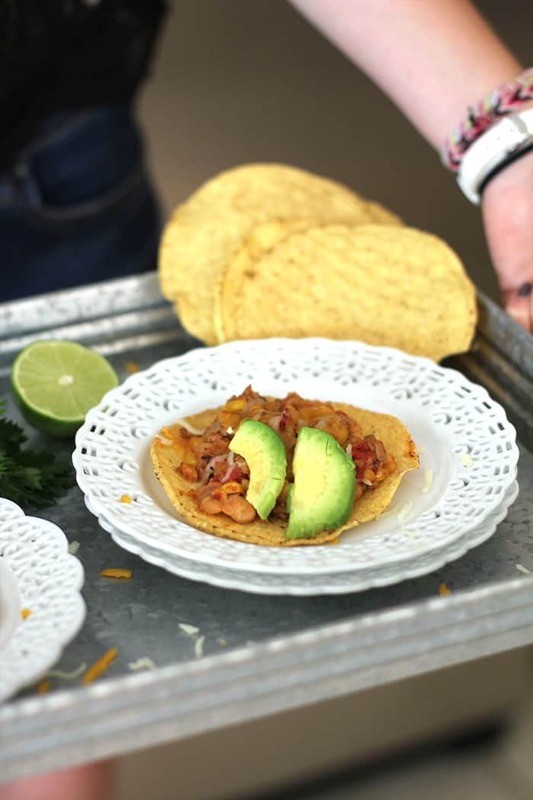 Make the meat and bean mixture ahead of time, and then simply bake the tostadas for 15 minutes with a sprinkle of cheese. Easy and so tasty! I don’t think I will ever get bored of Tex-Mex. There are so many different ways you can make tacos, enchiladas, burritos, fajitas, nachos, and tostadas. I have only begun to concoct these types of recipes. So I hope you are a Tex-Mex fan like we are, because I’ll be sharing all of my favs. I used Jennie-O turkey again for this recipe. It’s a great substitute for beef, and it’s become hard for my family to tell the difference. This meat and bean mixture takes about 30 minutes to make, and then it simmers for another 30 minutes or so. Besides the turkey, onion, garlic, jalapeño, and a few spices, the remaining ingredients are simply the following. A quick word on the spice level. I only used ONE jalapeño for this recipe. That’s REALLY not much, and they weren’t too spicy at all. I’ve had to start making two versions of my Tex-Mex. One with mild spice (like this recipe), and another with extra spice (jalapeños! ), mainly for Josh. 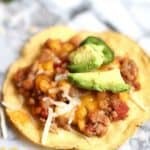 Please let me know if you try these Ground Turkey and Bean Tostadas, and how you like them! 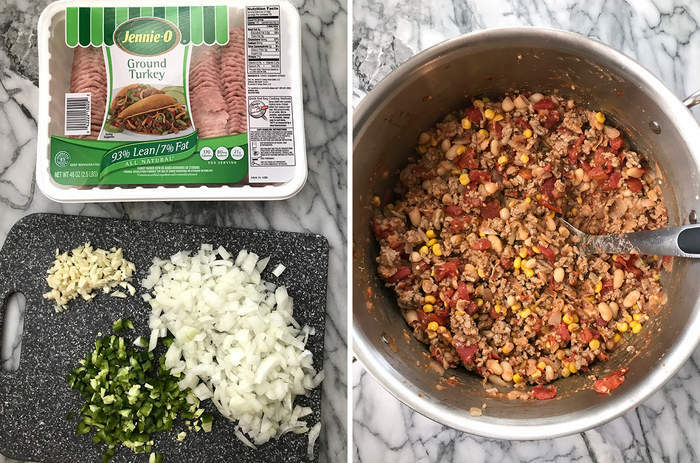 Spicy tacos made with ground turkey, white beans, corn, tomatoes, and jalepenos! In a large sauce pan, sauté the onion and jalapeño in olive oil, for about three minutes. Add garlic and stir for 30 seconds or so. Add the ground turkey and season with kosher salt, pepper, and cumin. Cook until the turkey is cooked through and then drain excess fat. Drain and rinse the cannelloni beans in a strainer. Strain one can of diced tomatoes but not the other. Add the beans, tomatoes, corn, and salsa to the meat. Simmer the mixture for another 30 minutes, or until liquid reduces. 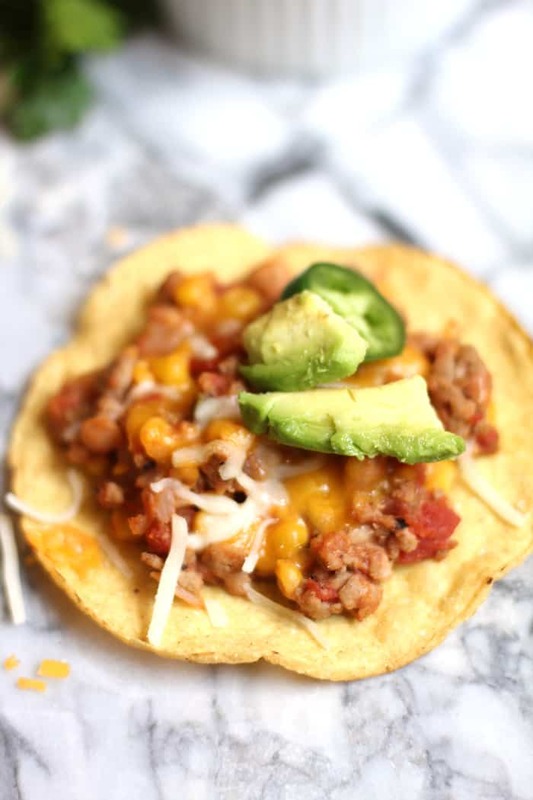 To serve, spoon the ground turkey mixture on tostadas and sprinkle with cheese. Bake in preheated oven, on 400 degrees, until tostadas are crunchy, and cheese is melted. 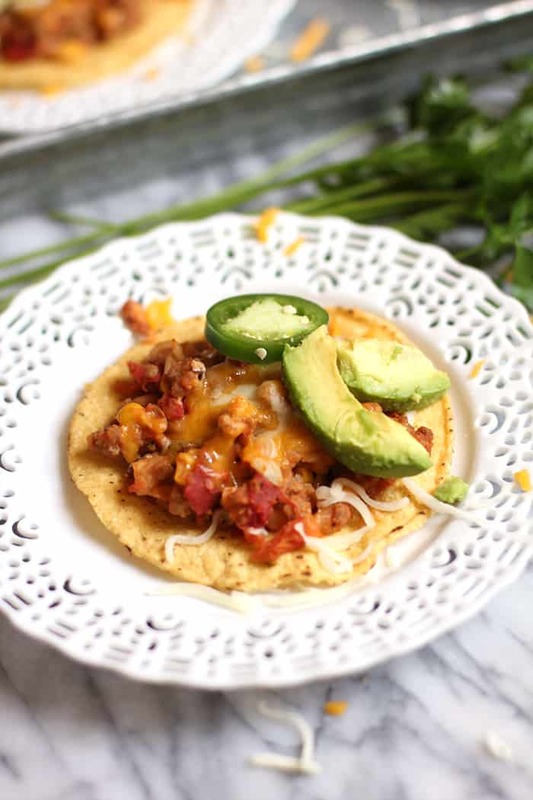 Remove tostadas from oven, top with jalapeño and avocado slices, and a little extra shredded cheese. Another Tex Mex winner!! Healthy too!! The avacado seals the deal with this dish. It is simple, yet delicious. It never gets old!